This religious Renaissance religious tapestry "Cowper Madonna - Raphael" shows the work of high Renaissance artist Raphael from 1507. Raphael was in Florence from the years 1504 to 1508 when he created paintings of the Virgin Mary and Child, seventeen of which survive to this day. Raphael was a High Renaissance painter and artist, who together with Michelangelo and Da Vinci, formed the three most prominent artists of the Italian Renaissance. Here we see Mary with child on a landscape, similar in style to those produced by Perugino in his workshop, which Raphael assisted with. 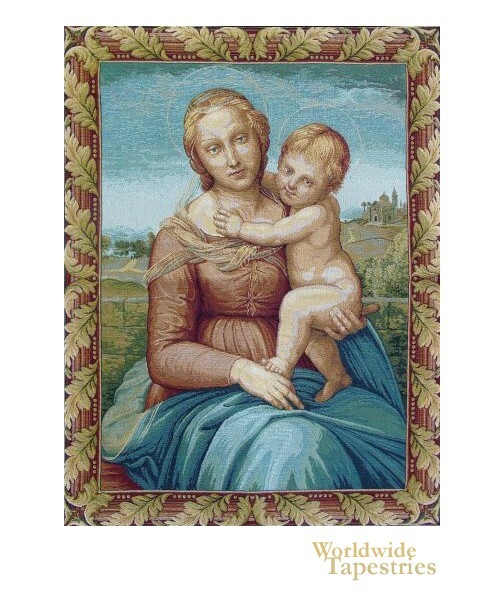 This religious Renaissance art tapestry "Cowper Madonna - Raphael" is lined and has a tunnel for easy hanging.